We offer over 40 mat classes per week including Pilates, Yoga, Sculpt, Bosu/Fitness Ball, Springboard equipment classes and TRX Suspension Training (Reformer Classes are NOT included). So come try as many as you would like to during a 7-day period — free! We recommend starting with Beginner and/or All Level classes. Class descriptions and levels can be found here. 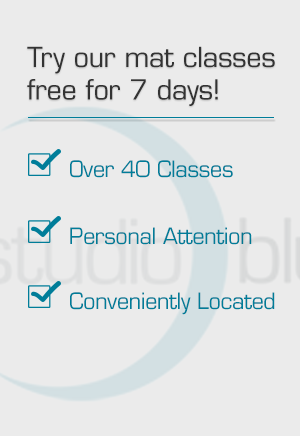 Call the Studio at 503-224-5073 or email info@studiobluepdx.com so we can set up your free week and reserve your selected classes in advance. If you need to cancel any reserved classes we ask that you call us at least two hours prior to the start of class so we can open up that space for another client. Please come 15 minutes early to your first class to fill out a brief client intake form and allow us time to give you a tour of the studio. If you prefer, you may also print the intake form here and bring it to your first class. Please wear form-fitting clothes that will allow your body to move comfortably and stretch freely. We exercise barefoot in the classroom, so you do not need any special kind of footwear or socks. When you arrive for class you will see a sign-in sheet on the front desk. Please sign in before each class (or initial next to your printed name if you have reserved in advance). Please note that for the safety and maximum benefit of all, clients will not be granted admission 5 minutes after the start of class. Please take a moment to review other studio policies here. Contact us to start your 7 day free trial!